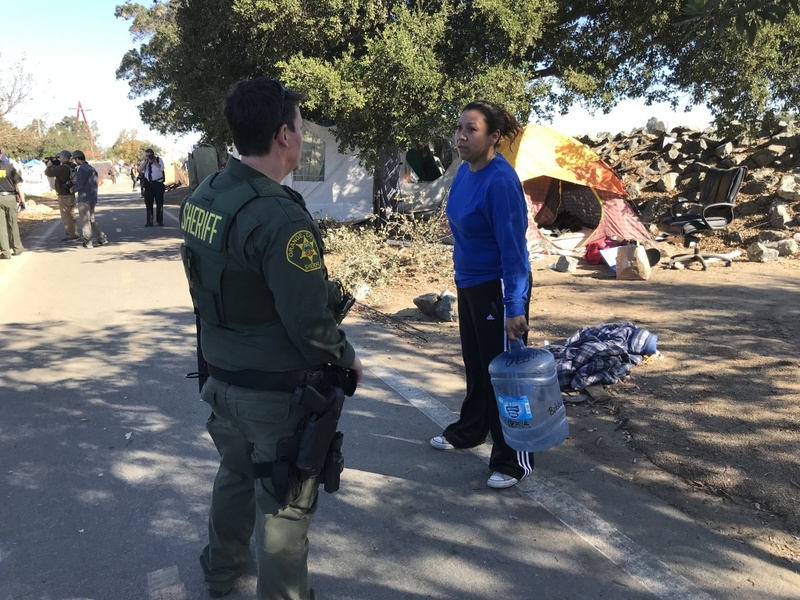 Orange County sheriff's deputy Molly Mussig talks to a resident about moving off of the Santa Ana riverbed on Monday, January 22, 2018. An Orange County judge has signed off on a plan allowing county officials to clear a large homeless encampment from the Santa Ana riverbed. In exchange, the displaced homeless will get 30-day motel vouchers while social workers help them try to get back on their feet. The legal fight over the camp has sparked a debate about how cities in Orange County treat homeless people. If the controversy sounds familiar, Los Angeles has gone through similar battles in the past. KPCC's Orange County Reporter Jill Replogle said that in this lawsuit, homeless advocates relied heavily on a Los Angeles case where a judge ruled that homeless people had a constitutional right to sleep. KPCC's Social Safety Net Reporter Rina Palta said these L.A. cases have shaped the city's policies around homelessness. Police can't arrest people for sleeping on the streets or in cars or take homeless people's possessions based on the reasoning that you can't punish people for sleeping outdoors if they aren't given alternative shelters, Palta explained. These regulations have made L.A.' homeless problem more obvious, she said. "It's pretty much why you see homeless folks wherever you go in the city these days because police can't simply kick them out anymore. And they're not just concentrated in Skid Row. Some would say that it's actually made the homeless population more visible in L.A. because people are seeing it in their own neighborhoods... And it has perhaps resulted in some of the changes we're seeing now with people providing public investments in tackling homelessness. Others would argue of course that this has made L.A. a magnet and a mecca for homeless." Replogle said Orange County's homeless population isn't nearly as big as L.A.'s, but the community is not used to seeing people on the streets so the Santa Ana River homeless camp was still shocking to them.